Most often when a person must perform chlorine testing on a water sample they have to use a chemical called DPD (What is DPD?) as the test reagent. DPD dissolved in water turns various colors (pale yellow through purple) in direct proportion to the concentration of oxidizers in the sample. We did a quick check and found that you can purchase DPD-1 Powder Pillows for Free Chlorine Testing on the Hach Company web site. The material has an approximate cost of around $21 per 100 powder pillows. A company called Industrial Test Systems came out with an alternative to the powder pillow that performs as well or better than the powder pillow. They called it the ReagentStrip and it works quite well without the mess that sometimes accompanies the act of trying to pour a small packet of DPD powder into a sample vial. According to the manufacturer, DPD-1 ReagentStrips work with chlorine testing meters manufactured by well-respected companies such as Hach®, LaMotte®, Orion®, WTW®, and others. Additionally, the DPD-1 free chlorine testing procedure stands and an equivalent to USEPA method 330.5 for wastewater and Standard Method 4500-Cl G for drinking water when used with a Palintest Chlorometer 1000 water testing meter or equivalent. Earlier in this article we mentioned that interested parties can pick up 100 DPD-1 powder pillows for around $21 on Hach’s web site. For those interested in the DPD-1 ReagentStrips, you can purchase 100 of those for around $19 on FilterWater.Com. Do the DPD Tablets Work in Hach Meters? Today’s inquiry comes to us from a woman serving her country in the United States Navy. ‘Ronda’ had a question about the DPD products she had seen on our web site. Good afternoon, Ronda, and thank you for this inquiry. When weighing the different DPD options (tablets, powders, reagentstrips, etc.) make sure you note the sample size that each test method will work in. As a general rule most devices that use DPD as a reagent will have 10 mL sample sizes, but we have also seen devices that use 15 mL sample sizes, 7 mL sample sizes and 20 mL sample sizes. Check your machine’s manual to find out what sample size it takes. In order to remain compliant with whatever drinking water directives you follow you will need to match up the sample size w/ the correct reagent amount. 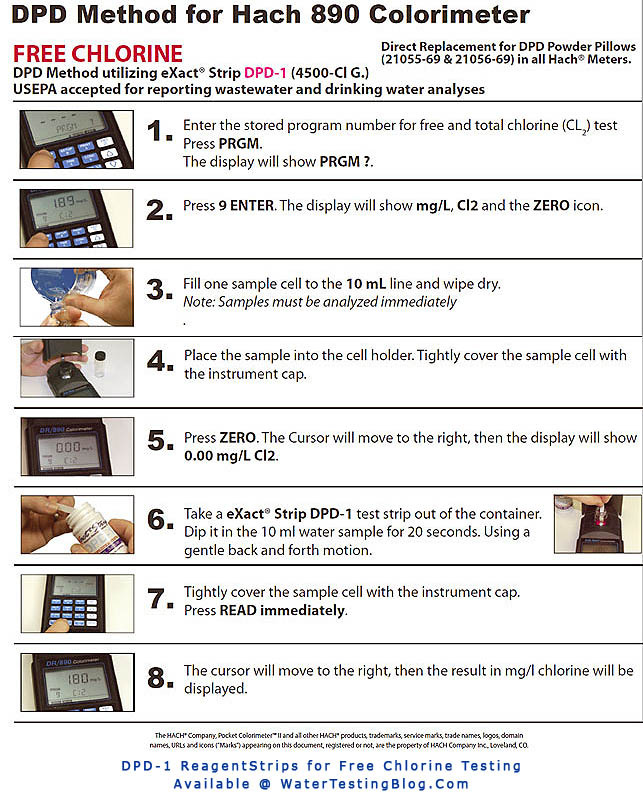 Specifically, though, you asked about the DPD tablets for chlorine testing that we have shown on our site and as far as we know all of the DPD products we have shown on our site work for 10 mL samples — except for the eXact Micro DPD products which work in smaller samples. Two 10-mL Tablets/Strips/Powders for a 20-mL Sample? While in theory that would work, definitely check your approved testing method to see if it expressly forbids that sort of thing and/or if it specifically calls for a brand or type of chlorine reagent delivery method. In the past we have seen where testing protocols have gotten so granular that they call out not only the type of DPD used, but also the brand of the test meter and DPD used for chlorine testing. No matter how many ‘new’ and/or ‘innovative’ methods scientists devise to make water safe for drinking, we believe a certain faction in society will still put its trust in the sanitizing effects of free chlorine. This also means we believe a need for chlorine testing will always exist. Thank you, John, for your question. We will begin by saying that you should immediately narrow your search by eliminating any water quality testing meters not using a form of DPD-1 as the reagent for free chlorine testing. While ORP meters do offer a good bit of utility, their readings do not directly monitor just free chlorine content of water and a great number of water quality purists still feel that traditional DPD chemistry provides the best means of determining a sample’s relative safety — based solely upon the sample’s chlorine concentration, of course. With that said, DPD comes in several forms: Liquids, Powders, Tablets, and ReagentStrips. To answer John’s question directly, though, we suggest that he take a look at the eXact Micro 7+ Water Testing Meter. It offers quality chlorine testing capabilities and the option of testing for a host of other parameters, as well — if desired. What sort of detection range does the meter have? So glad you asked! Naturally you will want to, or you should want to, know about the cost of replacement reagent(strips) for the meter. 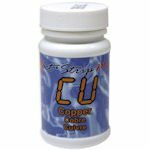 Since John asked about chlorine testing, below you will find links to, and pricing for, replacement DPD-1 and DPD-3 ReagentStrips — currently available at several online locations such as FiltersFast.Com and FilterWater.Com. * Free Chlorine ReagentStrips 486637 — DPD-1. Used to test for free chlorine residuals. Around $13. 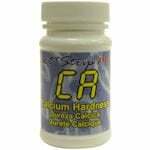 * Total Chlorine Test Strips 486670 — DPD-4. 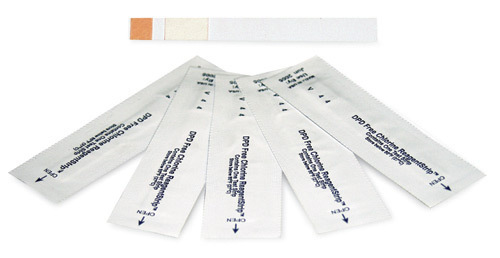 Used to test for total chlorine, but does NOT require the use of DPD-1 first, unlike the DPD-3 reagentstrips that come with the basic kit. Around $14 for 100 tests. 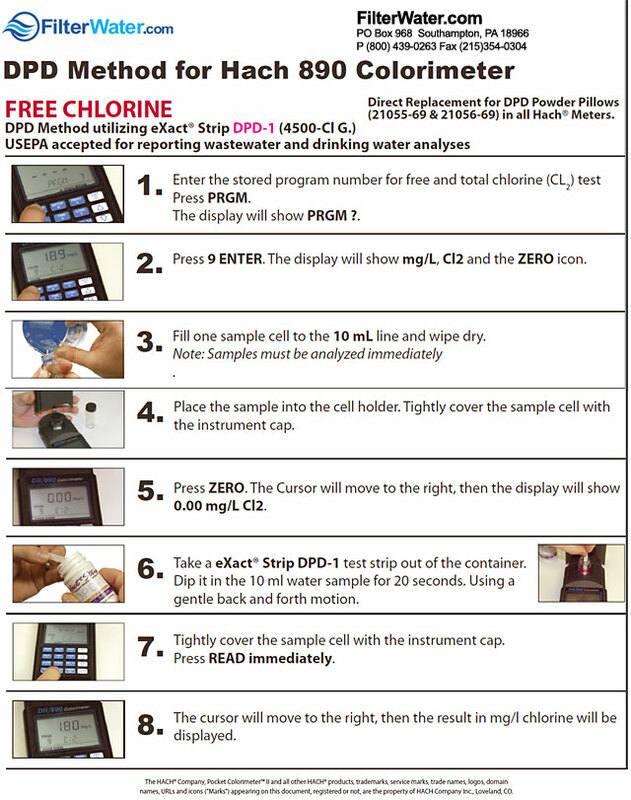 * ITS-EZ7-486637 — DPD-1 used for free chlorine testing. Around $13 for 100 tests. 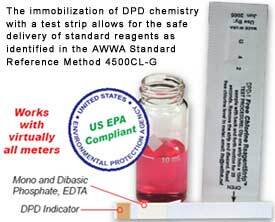 * ITS-EZ7-486638 — DPD-3 used for free chlorine testing. Requires use of DPD-1 first. Around $8 for 100 tests. 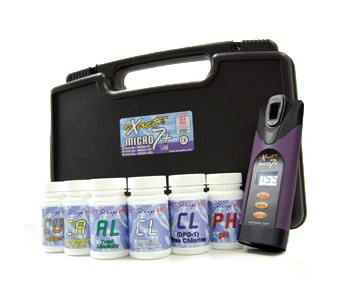 So if you find yourself in the market for a chlorine testing meter that uses an EPA Compliant testing method AND offers additional testing capabilities, definitely take a look at the line of eXact Micro 7+ Meters. Recently we received a request for a quote on 5,000 DPD #1 Tablets for chlorine (or possibly another oxidizer) level testing. 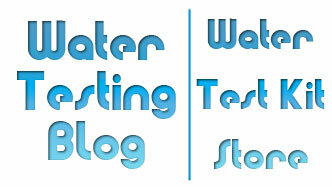 We’d like to remind remind everyone that although we link to a number of water quality products, Water Testing Blog does not stock or sell any products. … so they could attempt to save a few bucks (or whatever currency they use) on shipping. Now having said that, when it comes to DPD #1 we believe anyone thinking about using DPD tablets should at least consider using DPD-1 ReagentStrips in their place. ReagentStrips dissolve faster and easier than tablets (especially in hard or cold water) and contain no filler materials that could interfere with photometric optics. As far as performance, the manufacturer of DPD-1 ReagentStrips, Industrial Test Systems, Inc., had an independent laboratory conduct a blind water sampling study using DPD ReagentStrips, Tablets and Powder Pillows. In the end the ReagentStrips tested as good, and in some cases better, than other DPD reagent delivery methods. Every once in a while we get requests from foreign countries asking for pricing and availability of specific products. Unfortunately we do not know a whole lot about the International market and what products exist in countries outside of the United States and Canada, but we generally assume that interested parties can acquire the same stuff we can, just at a higher cost due to import taxes and shipping fees. Can you please give us the price for the “Hanna Checker HC Photometer for Free Chlorine” for our project in the Flood affected areas of Pakistan. Thanks for the inquiry, Zahid. 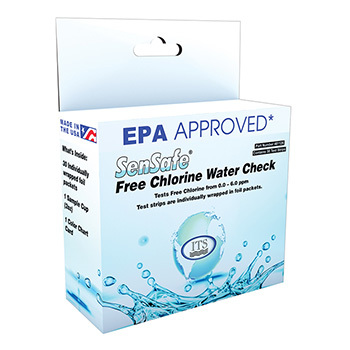 We really don’t know all that much about the “Hanna Checker HC Photometer for Free Chlorine“… except that a swimming pool supply company ( In the Swim ) began carrying this product at some point last Summer. Having said that, do you really want to use a pool water testing device to test drinking water? OK, so maybe not ‘new’, but having spoken with the manufacturers of this product, we can safely say that a whole lot of people who could really use this product do not know of its existence. 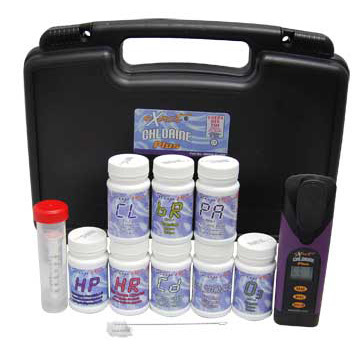 For years people conducting tests for certain varieties of oxidizers (Free Chlorine, Chlorine Dioxide, Bromine, Iodine, and Permanganate) have relied upon DPD-1 tablets, DPD-1 powders and DPD-1 liquids to help them obtain accurate, repeatable results. 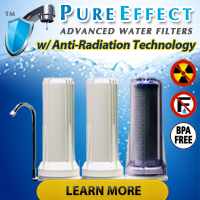 Now, however, an easier method of adding DPD-1 reagent to test samples has become available on FilterWater.Com, an online retailer of water quality testing and water quality improvement products. Why consider switching to DPD-1 ReagentStrips? The United States Environmental Protection Agency has deemed the DPD-1 ReagentStrip test procedure equivalent to USEPA method 330.5 for wastewater when used in conjunction with a Palintest Chlorometer 1000 equivalent meter (i.e. the eXact Chlorine Photometer). The United States Environmental Protection Agency has deemed the DPD-1 ReagentStrip test procedure equivalent to USEPA method Standard Method 4500-Cl G for drinking water when used in conjunction with a Palintest Chlorometer 1000 equivalent meter (i.e. the eXact Chlorine Photometer). eXact DPD-1 Reagentstrips deliver a precise dose of DPD-1 reagent into a 10 mL sample without the need to count drops (DPD-1 liquids). Working in the field with DPD-1 Reagentstrips becomes much easier since testing personnel will not have to worry about small or large gusts of wind blowing away their reagent as they attempt to add it to a sample (DPD-1 powders). Due to the ‘dehydrated nature’ of DPD-1 Reagentstrips, they will dispense rapidly and easily into hard and cold water without the need for laborious, time consuming tablet crushing (DPD-1 tablets). As long a the test instrument (i.e. meter or test kit) uses as standard 10 mL sample size, an eXact DPD-1 Reagentstrip will provide consistent test results regardles of who made the test kit/meter. If you use DPD-1 on a regular basis we think you owe it to yourself to give eXact DPD-1 ReagentStrips a try. Note: For those who know a thing or two about DPD, you may find yourself wondering why we didn’t compare the DPD-1 ReagentStrip to an old school method of reagent delivery called ampuoles which involves breaking glass tips off into test samples. Ahem… Breaking of glass in order to perform testing. Need we say anything more about ampuoles? 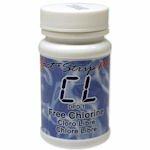 Most people looking to test their drinking water for chlorine want to know the concentration of free chlorine, also called the free chlorine residual, in their drinking water. Basically speaking, free chlorine (hypochlorous acid) acts as an effective sanitizing and disinfecting agent in lower concentrations but can cause serious harm and damage to organic material (i.e. human skin, hair, cells, etc.) in higher concentrations. The US Environmental Protection Agency has set the Maximum Contaminant Level (MCL) for free chlorine at 4.0 parts per million, also known as milligrams per liter (mg/L). The most commonly used test for free chlorine residual uses a reagent called DPD (what is DPD?). More specifically, it requires DPD-1 and DPD-1 comes in several different forms: liquid, powder, tablet and reagentstrip form. We recently learned that the maker of SenSafe Water Test Kits has released a new version of the eXact Micro Meter Water Testing Kit that makes accurate chlorine testing with DPD-based chemistry easy for experienced testers and novices alike. Introducing, for all your chlorine testing needs, the eXact Chlorine Photometer… a digital meter for testing chlorine that has a detection range of 0 to 11 parts per million for both free and total chlorine without the need for drop counting, crushing tablets or dissolving powders. Aside from the 0.01 ppm resolution with +/- 0.02 ppm accuracy between 0.00 and 2.39 ppm chlorine and its high detection limit of 11 parts per million, the eXact Chlorine Photometer also offers a great deal of versatility for those who may want to test for other water quality parameters such as… Ammonia, Bromine, Chloride/Salt, Chlorine Dioxide, Chromium (in Hexavalent Form), Copper, Cyanuric Acid, Fluoride, Iodine, Iron, Low Range Total Hardness, Manganese, Nitrate, Nitrite, Ozone, Acid pH, Alkali pH, Potassium, Sulfate, Sulfide, and Turbidity. If the need arises where you need, or want, to test for parameters other than free and total chlorine, simply pick up a bottle of the appropriate reagentstrip and follow the simple instructions in your meter’s manual.